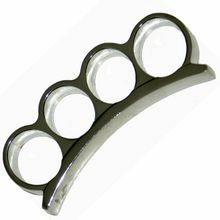 These knuckle dusters are extra wide, 3/4 inch and are cast in the "half knuckle" style without the palm support of the traditional design. They weigh about 6 oz. each and have a nice smooth finish. They include a belt stud that screws in to a pre-tapped hole to make it a functioning belt buckle. Finger holes are about 1.25 inches. (that is way over a size 15 ring with wiggle room). We have silver color available. We also have a jr. version for smaller hands. They fit my 5' 2" wife just fine. Holes on this one are about a ring size 12. Note: We can only ship brass knuckles to the billing address of the paying credit card, ie, dual address orders are not allowed. We cannot ship brass knuckles to FL,MA,MI,NY,DC,IL,RI or CA. If you are caught with these in your possession, you may get in trouble with the law.